Get out your calendar because I, Keri Swan, have got some suggestions and tips for you! Now, my list is going to reflect my own personal tastes and experiences that come from being an active mom and wife that loves clothes, art, being outside and this awesome community... so you'll note that I will highlight things in that realm. : ) Enjoy! This is one of my MOST favorite events of the year and makes a great date. I don't think it makes a great family event unless your kids are good at not touching things. The weather is usually ridiculously gorgeous, it smells like candied almonds, and there is something inspiring and beautiful for everyone. Keep your Christmas or Birthday gift list in mind. Try to bike there or be ready to park and shuttle. Every time you buy from an artist, you can enter the Boise Art Museum’s raffle. Go early- Friday at 10am for the least crowded time frame. If you're like me, you have friends and family with a special knack for finding treasures in a giant pile of junk. They walk in a thrift store and find a tiffany lamp for $5 and I....well I just get itchy and nervous. At this event I usually find something I can wear and I love it because it is big, well organized, and I have found great quality items and brands I like. Best part? Eagle Nazarene church hosts this event for providing education to kids in Kenya. Donate or Volunteer and you'll get special early access on the Wednesday before. This combines two things Scott and I LOVE to do: Paddleboarding and Winning. Hah ha… I joke, but isn’t competition fun? Contestants will SUP across Quinn’s pond and back, then run 2 miles on the greenbelt. Then, they will cross the finish line feeling awesome and thankful to the max and enjoy some music and snacks. The only thing I that could improve this is a rollerblading/whistling contest so I can showcase all my strengths. 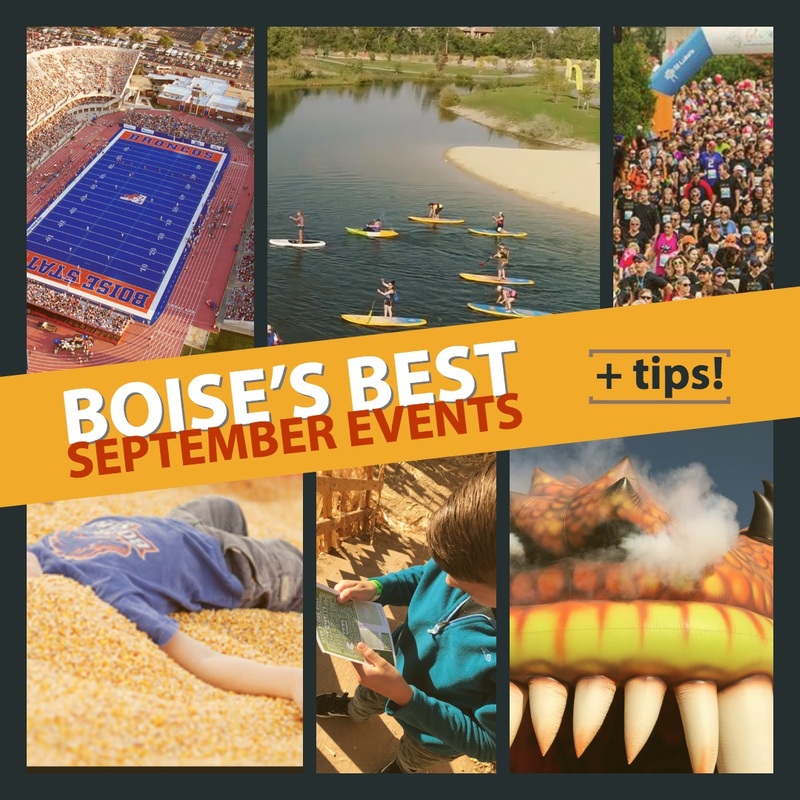 Cool factors: You can run as a team or individual, kids are welcome to participate, and proceeds from the race go directly back into protecting the Boise River. This is only the second year and I haven't raced it, but the sign up says there are paddleboards availble for the race from Idaho River Sports is giving free rentals to participants in the race on a first come first serve basis. The only home game this month is on September 8. If you’ve never been to a game you should! If only to say you saw a game on the Smurf Turf. There is nothing like the electricity of a crowd at a college game. Watch those young guys run out on the the field and admire how they don’t even trip in front of 35,000 people! I get all teared up that their hard work is bringing them to big bright lights and also that I am old enough to be their mom. I know that’s weird. Not the getting old part, the crying for perfect strangers part. Anyway, I recommend going to at least one home game— preferably an early season game when everyone has sky high hopes and you can go in a tank top and put on a jacket when the sun goes down. Because later in the season there WILL be some biting coldness! Go early, walk through the hordes of tailgaters and enjoy the enthusiasm!! I love this picture of our son screaming "STATE" back to the other side of the stadium from the last time we went as a family. He really took his cheering duty seriously. Get your Bronco shirts/hats early. The best ones always sell out. Also, please do not leave me alone with the chips and guacamole or any kind of cookie. Always check the weather so you don't have to buy $20 ponchos. The World Center for Birds of Prey begins their Fall Flight Demonstrations this month. They hold these demonstrations in front of a beautiful view of the valley right outside their center every Friday-Sunday until Nov. 4. This is an incredible opportunity to see owls, hawks, falcons and eagles up SO close as they fly overhead (sometimes just inches above). The educators here are top notch. This is a unique and heartfelt organization. If you’re really into birds, while you’re there ask them about visiting bird banding sites through May or September/October. (Or just read about it here). Get there EARLY. Saturdays are busiest. They will close the road up to the center during the demonstration itself to protect the birds… so plan accordingly. It is weather permitting, so put it on your schedule early in the season so you can go back if it’s rained out. I’m telling you now for a reason! There are two in our Valley — Farmstead and Linder— and they are both great for different reasons. Attendance is the epitome of autumn traditions— with spiced lattes, too much candy and bean dip, apple picking, costumes and costume anxiety, pumpkins and letting your kids roll around in corn kernels until you realize it’s been traveling down many buttcracks and out pantlegs. Ask my sister about the song she made up about that last part. Be prepared to spend more than you really want and go EARLY in the season because truly there is still plenty to do in October. The maze is more dense and offers a better challenge, and the lines are shorter because most people are still in *summer* mode in September. We Idahoans transition slow and easy here. Just like we merge… Sorry. And, October averages more rain and cloudiness. So pick up your apple pie latte or whatever you drink and go get harvest-y. Save money by eating before you go. And, if you want to never go again, wait until the weekend closest to Halloween and suffer through lines. Your kids will tell you, "We don't ever have to do that again." Gracie Barra (pronounced BAH-ha) is a new jiujitsu gym located near Hawk Stadium off Glenwood in Garden City. Brazilian Jiujitsu is emphasized by the "constant live free-form practice of leg locks, arm locks, pins & choke techniques against a resisting opponent." Our two boys have been LOVING this place, the encouraging atmosphere, the sparring, and, I think, their ability to progress and actually practice the craft the last 15 minutes of every class. This month Professor Ray is holding free Anti-Bullying classes every Saturday. What kids do you know couldn’t use a few more moves to boost their confidence? Sign up for regular classes. You can go once a week or 6 times a week for the same price. This race is special because of the exciting, supportive, health-focused atmosphere. It has had big attendance from mostly women (used to the the Women's Celebration) in the past and continues to get good participation. A perky crowd in lycra swarms at the picturesque crossing of capitol and main with capitol behind them and Train Depot ahead of them. KTVB usually hosts a pre-race warm up and motivational bit before the race that spurs dancing and camaraderie . The expo is enjoyable and the health-centered message is fantastic. Cool Factor: Lots of post-race yummies. See how many fun things are going on this month? It's arguable one of the best months of the year for fun family events.